A farewell ceremony for the late Ara Güler was held Saturday in Istanbul. 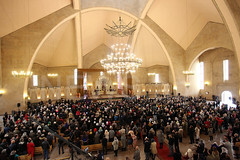 According to Agos daily, the ceremony began in the Armenian church and was held to Armenian melodies. Güler was buried at the Armenian cemetery of Sisli. 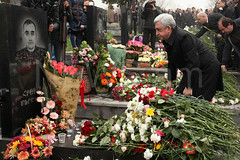 Thousands of Turkish, Armenian, Kurdish intellectuals, officials and politicians bid their final farewell to Ara Güler. As reported earlier, famous Istanbul Armenian photographer Ara Güler passed away on Wednesday evening. Güler was born on August 16, 1928 in Istanbul, Turkey.